As more and more business travelers depend on portable hard drives to both back up their data and carry it around with them, the technology has been consistently improving. Even with the proliferation of cloud data services, hard drives are often considered more private and secure (and are especially useful where there is no wireless connection). Hard drives are getting larger (in volume) while simultaneously getting smaller (in size). As a concession to consumer tastes, they're getting prettier too, often coming in a choice of style-minded colors. And they're getting smarter, with cloud-savvy features for added backup protection and file-sharing simplicity. Some drives have even cut the cord, relying on Wi-Fi to not only read and write files wirelessly, but also stream photos and videos to mobile devices. In this roundup, I've tried out seven of the latest models, all of them compact enough to ride in a pocket (and certainly a carry-on). Two of the drives -- the Corsair Voyager Air and Patriot Aero -- are equipped with compelling Wi-Fi features. The five other drives -- the Buffalo Technology MiniStation Slim, the Seagate Slim, the Silicon Power Diamond D20, the Toshiba Canvio Connect and the Western Digital My Passport Ultra -- incorporate USB 3.0 interfaces and, as a result, promise lightning-fast file transfers (though some units were definitely faster than others). I worked with them using three different platforms: an Acer Aspire 8950G laptop running Windows 7, an AT&T iPhone 4S and a Verizon Wireless Samsung Galaxy S4. To benchmark performance, I used the ATTO Disk Benchmark tool and ran the tests on files ranging from 1MB to 8MB. Which mobile drive is the best for you? It depends on a number of factors -- read on and find out. True to its name, this is one skinny drive, measuring a scant 0.3 in. in depth and weighing just 4.9 oz. Only the Silicon Power Diamond D20 weighs less, and that's by a fraction. Even the most overstuffed carry-on bag can accommodate a Slim. It's an attractive addition, too, modeled in your choice of silver or black, with an aluminum shell that feels more than solid enough to withstand everyday dings and drops. However, the status LED is inconveniently located at the rear of the drive, where it's difficult to see unless you angle the drive away from you. The 500GB Slim -- currently Buffalo's only available capacity for the drive -- delivered average performance in benchmark testing, outpacing the Silicon Power and Toshiba drives but running a distant fourth to the USB 3.0 speed-demons from Corsair, Seagate and Western Digital. At least it has both functionality and security in its corner, with a solid suite of Buffalo tools for backup, encryption and password protection. 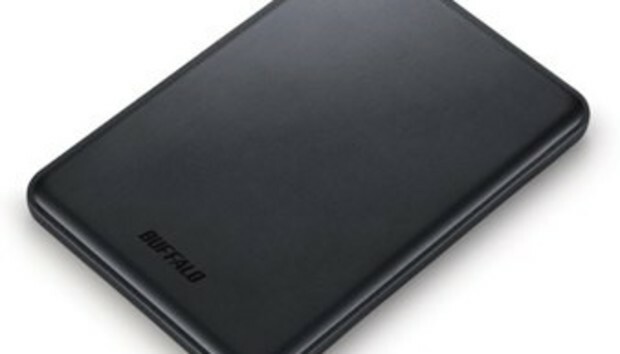 Buffalo's $89.99 price tag is a bit higher than what you'll pay for other 500GB drives in the group, making its so-so performance all the more acute. It's a lightweight and versatile companion, to be sure, but not exactly the top value. Heavy, chunky and not quite as travel-friendly as the other drives here, the Corsair Voyager Air is nonetheless the most versatile portable storage unit in this roundup. It's a lightning-fast, battery-powered 1TB drive that can double as network-attached storage. And it also has built-in Wi-Fi, meaning it can sit in your travel bag while you copy files, stream media and so on -- all without interrupting your Internet connection. A pass-through option lets your PC or mobile device continue to use the local Wi-Fi network even though it's also using Wi-Fi to connect to the drive. When connected to a USB 3.0 port, the Voyager Air compares favorably with the roundup's fastest standalone drives from Seagate and Western Digital. (Surprisingly, it charges completely via USB and requires no additional power supply, though it does come with both AC and car adapters.) Corsair doesn't specify how many devices can connect simultaneously, but I had no trouble streaming an Amy Winehouse album to my iPhone and PC at the same time. However, weak mobile apps prevent the Air from realizing its full potential. Although a smattering of short video clips streamed fine to my iPhone, most produced an error message saying they wouldn't play or were too large. In the latter case I could download them directly to the phone, but that sort of defeats the purpose. All these same videos played fine using Kingston's MobileLite Wireless. What's more, there's no "Select all" option when choosing files to upload from device to drive. If you want to back up, say, your camera roll, plan on doing a lot of tapping. Corsair backs the drive with a three-year warranty, icing on a pricey (minimum retail price is $200) but very worthwhile cake. If the company can improve its apps' streaming capabilities, it'll have the portable hard drive to beat. The Patriot Aero arrived as a last-minute entrant in the roundup, and this one was worth the wait. The Aero functions much like the Corsair Voyager Air, offering both USB 3.0 and wireless connectivity, but in a more compact and less expensive package. It comes in both 500MB and 1TB capacities; I tested the 1TB version. Fortunately, just because it's smaller and cheaper doesn't mean it's slower: The Aero posted impressive benchmark numbers, proving almost exactly as fast as the Air -- at least when connected via USB. As for power, you can charge the drive via USB or the included AC adapter, although unlike the Corsair, it doesn't come with a car adapter. The Patriot Connect app, available for Android, iOS and Kindle Fire, affords the usual upload, download and streaming capabilities, with support for up to five simultaneously connected devices. However, the apps make for poor MP3 players, lacking both search and play-all options. You can build a playlist on the fly, but it's a slow, cumbersome process. Thankfully, all my sample videos played just fine. As with the Corsair, you can set up a pass-through connection. However, the iOS app in particular was very slow to discover my home network, and both the Android and iOS apps produced a curious 45-second countdown timer for "restarting the Wi-Fi connection," followed by a message indicating I needed to manually reconnect to the Patriot. Ultimately everything worked, but it was a slow and confusing process to get there. That annoyance notwithstanding, the Patriot Aero makes a great all-purpose portable drive, especially for accessing video and documents that wouldn't otherwise fit on your mobile device. The 500GB Seagate Slim -- not to be confused with Buffalo's drive of the same name -- has style to spare, with a brushed-metal black top (also available in silver) and a pulsing sliver-shaped status LED sliced into that top. It is, in a word, gorgeous, by far the most attractive portable hard drive in the group. And, yes, it's slim, only 0.4 in. in depth -- though that metal exterior makes it slightly heavier than competing drives. Sometimes good looks belie what's underneath, but the Seagate blew the doors off most of the others in this roundup. Only Western Digital's My Passport Ultra turned in faster benchmark scores, and those by a narrow margin. What's more, the Seagate is compatible with both Windows and Mac systems, requiring no reformatting to switch between them. Seagate's Dashboard software took an annoyingly long time to install, required a reboot, and ultimately failed to run on two Windows 8 testbed systems, crashing after each launch attempt. And although it provides convenient one-click and scheduled backup options, including handy archive capabilities for your Flickr, Facebook and other social-network media, it has no security or encryption features. That's a potential deal-breaker for business users, who might otherwise appreciate the Slim's attention-getting design and blazing speed. Likewise, Seagate's crash-prone software makes this drive more frustrating than it should be. Although Silicon Power isn't as well-known as some of the other brands in the group, its Diamond D20 drive bears a strong resemblance to the Buffalo MiniStation Slim and Seagate Slim, at least in terms of form factor and capacity. It's a compact 500GB drive with a solid aluminum chassis. There's only one color choice, a glossy white that resists both fingerprints and scratches, and although it has a plasticky finish, it's pretty. It's also pokey, at least compared with the four other non-Wi-Fi drives. The D20 had the lowest test scores of them all, though it was practically tied with Toshiba's Canvio Connect and not far behind Buffalo's drive. Still, if performance is your key concern, this isn't the drive to pick. On the other hand, if you're more interested in reliability, this is definitely a drive to consider: Silicon Power backs it with an above-average three-year warranty. The company includes no software on the drive, which might please power users who tend to delete such bundleware anyway. For those who want it, Silicon Power's SP Widget (Windows only) is available for download, but you can do better than this mediocre mix of backup and security utilities. As of this writing, the Diamond was selling only at Amazon for a price of just $51.69 -- making it the most affordable drive in the group. Beyond that, it's a decent, if unexciting, portable drive notable for its durability and excellent warranty. The Canvio Connect is all about choices. It comes in five glossy colors (black, blue, red, silver and white) and more capacities than any other drive here: from 500GB up to 2TB. I reviewed the 750GB red one, which dazzles despite being a little thicker than most of its brethren. Physically, it comes closest to the Western Digital My Passport Ultra, but feels a little more solid. Alas, it doesn't perform quite the same: The Canvio ran 50% slower than the Passport, at least as reflected in our benchmark tests. However, Toshiba packs a lot of utility into the drive, starting with the bundled NTI Backup Now EZ utility (which lives up to its name with extremely easy incremental, scheduled backups). You also get Pogoplug, which turns the drive into an Internet- and mobile device-accessible file server and includes 10GB of cloud storage. The latter adds a nice secondary-backup option for your most critical files. Like Seagate's Slim, the Canvio offers Mac compatibility via third-party software; no reformatting required. If you're seeking a versatile, cloud-savvy drive that's available in much higher capacities than most, the Canvio is definitely worth a look. In a crowded field of lookalike and act-alike portable hard drives, Western Digital's My Passport Ultra tries its best to stand out -- and for the most part succeeds. It comes in your choice of four colors, incorporates a cloud-friendly backup option and features Western Digital's above-average three-year warranty. It's fast, too, posting the top read/write scores of any drive we tested -- though Seagate's Slim ran it a close second. If you want a drive that can copy your presentations, videos and other big files in a hurry, this is it. However, the Ultra's plastic casing looks and feels cheap and flimsy; one suspects that a sudden encounter with the pavement would crack it wide open. What's more, this is physically the largest non-wireless drive in the group -- not dramatically or inconveniently so, but it lacks the elegant slenderness of, say, the Seagate Slim. Western Digital's WD SmartWare Pro software includes password and encryption options for the drive itself and two backup options: local and Dropbox, though you'll need your own account if you want to use the latter. (That's in contrast to Toshiba's Canvio Connect, which includes a 10GB Pogoplug account.) These are simple but efficient tools for making continuous or scheduled backups. If you prize speed above all else and don't mind paying a slight premium for it, the My Passport Ultra wins the day -- even if it could stand to slim down a bit. While some of these portable hard drives are a bit better than others when it comes to design, performance, warranty and bundled software, there's really not a bad option in the group. Corsair, Seagate and Western Digital share the speed crown, while Corsair and Patriot get points for severing the USB cord altogether -- though Patriot's model wins the day by being more compact and less expensive. How important is speed, anyway? For some users, it won't be at all important, as any of these units will blow your existing USB 2.0 drives out of the water. That said, if you want really fast file transfers, look to the drives from Corsair, Seagate and Western Digital. You should also consider each drive's warranty. While the average is two years, some models are covered for only one year, while a few raise the stakes to three. Obviously there's no way to predict when a drive might fail on you, but a longer warranty does suggest greater durability. Whatever drive you pick, you're likely to enjoy high-speed file transfers and a barely noticeable bulge in your carry-on -- the real joys of portable storage. 3.1 x 0.3 x 4.5 in. / 4.9 oz. 9.6 x 2.0 x 6.8 in. / 16 oz. 3.9 x 1.0 x 5.5 in. / 11.2 oz. 3.0 x 0.4 x 4.5 in. / 5.3 oz. 3.1 x 0.4 x 4.9 in. / 4.8 oz. 3.1 x 0.8 x 4.3 in. / 5.8 oz. 3.2 x 0.6 x 4.3 in. / 5.4 oz. *Tested using the ATTO Disk Benchmark tool with an 8MB file. Higher numbers are better.